You could spend a lot of time and money transplanting Miata parts into some scaffolding to build an Exocet, or you could simply use what’s already there. One Real Dude of Genius did the latter, and the results are for sale on Craigslist. I mean, the Miata already comes with a structure. Who needs superflous things like bumpers, bodywork or that stupid folding convertible top that gets crappy after a while, anyway? All you need are the basics that hold it together, so take off the rest and you’re golden. This was a 1991 Mazda Miata. It was purchased a few years ago and has been weight reduced since. Is a blast to autocross, spiritually drive, or even just cruise through town in. It does drifty things, burnouts, and makes people smile. What more do you need? Car weighs 1500lbs, have 3 sets of wheels and tires, and hundreds in Stock miata parts I can throw in. Car has been caged (which is now blue), lowered. I really don’t know what else to say about it other than it is the most fun vehicle to drive. Clean wi title, can arrange for transportation. I will not allow test drives without cash in hand. 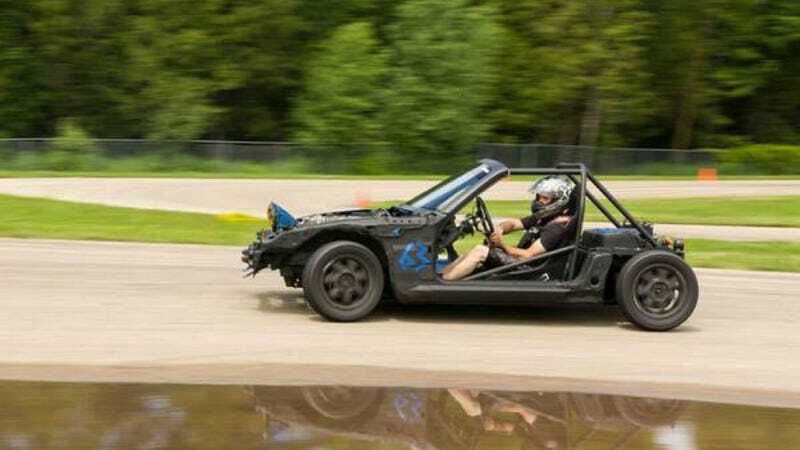 According to the owner on YouTube, the only money he really spent on the conversion to a poor man’s Exocet was on the custom-built rollcage. Problem was, the more race-prepared the car got, the less the owner enjoyed driving it on the road, so eventually, part of it went the way of the sawzall. I wanted spare Miata parts, was no longer enjoyable to daily drive, and had several sawzall blades at my disposal. For those of you who follow 24 Hours of LeMons racing, I think we’ve found Sasha’s soulmate. Of course, the “Miata-ish” is also now considerably more nose-heavy than it used to be. Per the YouTube description, the car handles worse than a stock Miata, but is considerably easier to get sideways. What more do you need? While I hate to see a (formerly) Mariner Blue car meet the cold blades of fate, I can appreciate that the owner painted the cage bright blue once the car got into its current incarnation. If you ever thought that regular Miata was too closed-in, this could be yours for $2,000. All photos belong to the original ad on Craigslist. For $59,000, Is This 2002 Ultima GTR The Ultimate Performance Deal?